NASA’s New Horizons captured this high-resolution enhanced color view of Pluto’s moon Charon, showing the crack on the icy moon. It was taken just before closest approach on July 14, 2015. The image combines blue, red and infrared images and the colors are processed to best highlight the variation of surface properties across Charon. 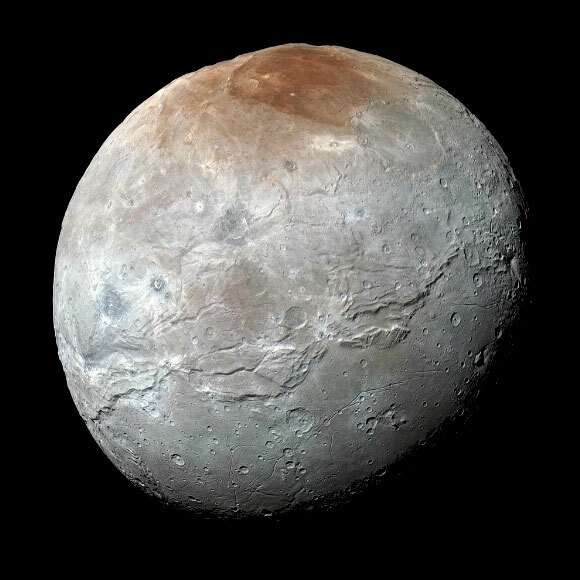 Astronomers at the University of Rochester have developed a new model that could offer a new explanation as to how cracks on icy moons, such as Pluto’s Charon, formed. In the paper, published by the journal Icarus, Quillen states that “strong tidal encounters” may be responsible for the cracks on icy moons such as Charon, Saturn’s Dione and Tethys, and Uranus’ Ariel. 1 Comment on "New Model Could Offer an Explanation for Cracks on Icy Moons"